Each month, 10 Best Design releases its winners of the Best Web Design Firms Awards. The 10BD team is especially proud to make this month’s awards public as they mark the beginning of additional category specific awards as well. 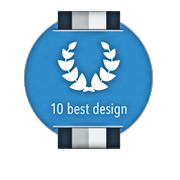 10 Best Design has become the internet’s most prevalent awards specifically for web design firms. They grew from their now renowned overall Best Web Design Firms rankings to a multifaceted awards network which reaches far beyond. Along with this month’s Best Firms release comes an exciting new announcement. 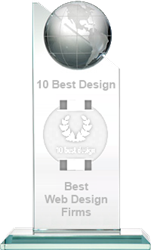 10 Best Design is proud to announce that it will be releasing two new web design awards for firms who excel in highly advanced, cutting-edge web design techniques. The winners of these skill-set specific awards will receive a substantial amount of publicity, tons of traffic from the highly visited awards site, and several other great perks. The upcoming awards will be held for the Best Responsive Web Design Firms, as well as the Best Parallax Web Design Firms. Responsive web design refers to a relatively advanced form of development which utilizes varying design layouts based on the detected width of the browser. It’s prevalent in modern mobile development. Parallax web design allows designers to give viewers alternating points of reference. As a viewer moves up and down the web page, layers and images move at variable rates. When done correctly, a 2D website can have a feeling of depth and 3D motion. As 10 Best Design gears up for these new awards, the 10BD team is also proud to announce the winners of their Overall Best Web Design Firms Awards. As always, these firms are the best in the industry – many of whom utilize the modern techniques described above. This month, the winner of these awards is Buildrr. Buildrr is based in Syracuse, New York and even has a responsive web design for their home page. In the past, Buildrr has been awarded by a number of notable organizations. In fact, they were once also named the “Best in Search” by TopSEOs.com. Coming in second place, The Creative Momentum has become a consistent fixture on these 10 Best Design awards. The Creative Momentum offers a wide variety of design services to businesses in their Atlanta Area and around the world. CLiKZY Creative, a Washington, D.C.-based firm, ranks as the third of the 10 Best Web Design Firms Awards for their work on more than 250 design projects since 2006. CLiKZY Creative has appeared in Inc., Smashing Magazine, ComputerWorld, and more. For more information, visit 10BestDesign.com.